I am a potter, and teacher of ceramics at University of Florida, Gainesville, FL. 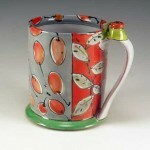 My web site, LindaArbuckle.com, has additional information, including ceramic technical handouts. 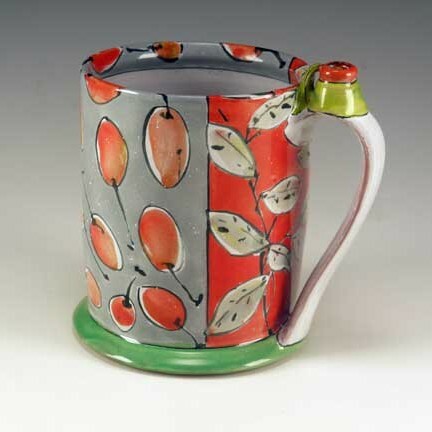 My studio work is usually earthenware, often majolica-glazed and mostly decorated functional ware. My home and studio are outside of Micanopy, FL, where I live next to wetlands with my potter spouse, a large monster-truck mix dog, cats, and chickens . Nature and making things are life-long interests, with involvement as time permits with food and cooking, knitting, ceramic materials, computer geek things on an end-user basis, gardening, wildlife, drawing, reading fiction, beading, sewing, and other passing interests. I was a teen in the sixties, and appreciated the ideas of making and doing first-hand to enrich and transform life. The sense of adventure and engagment in the thrill of the chase of creating keeps me going back to the well over and over. When I finally got to art school, I found I was not alone, and feel very at-home in the community of other makers. It’s a values-driven world of thoughtful people, usually in both senses of the word, and I feel fortunate to be in those worlds. Studio life has been a slow the past several years. Arthritic changes have necessitated knee replacements, and joint renovations on my hands. I continue to make things, and am picking up speed these days, hoping recovery from my various amendments is the last I’ll see of that for a while. My web site is continuing content about my studio career. This blog is intended to be a more changing kiosk of what’s up at the time. I am a former china painter with several years experience in pottery, high and low fire, and a 5 month acquaintance with making and decorating majolica. I am very interested in participating in a hands-on workshop in the preparation and decoration of low-fire ceramics in the majolica technique. I especially enjoy your very loose and fluid style and hope that you are recovering well from your latest round of body reparations and may be offering such a class in the near future. If not, perhaps you can recommend another possibility. Thanks for your interest. Best on your majolica work. Can you achieve near results in your work if you used porcelain? I’d prefer to avoid low fire clay because I work in a classroom environment and it would be too easy for new students to get it mixed up. Hello Deanna, you need to find a non-moving, viscous glaze at the temperature you’re firing to, and adjust the decorating color flux. If you use cone 5-6, there is a cone 6 recipe for a majolica on the “Lowfire and Majolica” handout on my web site (http://lindaarbuckle.com/arbuckle_handouts.html). At cone 10, you can decorate in a similar way on top of shinos, which generally don’t move in firing. I also am interested in decorating in your style but I also use porcelain and I am having a lot of trouble of having the colors of my underglaze paint last after the final firing and not burn out. Do you have any recommendations for coloring and painting on high fire? You need to determine whether your colorants are able to go to the temperatures you’re firing to, and the kiln atmosphere you’re using. Check with the underglaze manufacturer. I continue to be amazed at the openness, sharing and encouragement that you (along with the many other ceramics artists) exhibit. I’m a new potter and grateful for everything you (and others) do to help us newbies. I’m looking for an Amber Celadon glaze recipe (long boring story re: our school studio can’t find its tried & true recipe. And, yep, now we’re at the bottom of the barrel. or, I should say, 5 gal bucket.) And Dr. Internet took me to your list with a bunch to try. Complete with notes. Yowzah! Glad you found helpful things. Hope your amber celadon tests well. People have helped me, and those people don’t need my help, so I try to pay it forward where I can. Ceramics is a field of generally kind, helpful people. I’m thankful to have such a community. Thanks for the note, Liz. You have a wonderful understanding of the empty space . That is the space thats not the object. I used to tell my students ” draw the space between the objects ,then they will appear. it’s what sets your work off from the rest. I also love the fact you add friendly advice. Thanks, Dale, I appreciate the feedback! Love your work…I am a potter too. I have worked in under glazes for years. I love to do painting instead of the more traditional dip and pouring. My question is now that I’m getting older, I find that I do mostly teaching and do not have time to throw as much. I will always keep throwing but thinking about just moving toward using molded pieces. I see that you use red earthenware, do you make each piece of your work or do you have workers that reproduce your pieces, or are red earthenware pieces sold anywhere? Thanks, Sharon, for your compliments. I am right there with you about teaching and time – students teach me many things through their questions and solutions (and it fun to work with young artists), but it takes more time than one would think to teach. I find I need summer to make much of the work, and then can get a bit of decorating done when school’s on. I do make the works myself. I’ve tried to get the studio cats, O.C. and Spike, to help, but no luck. People have suggested using molds or hiring help, but I feel I learn things from making the forms that add to my understanding of the geography when it comes to surface organization. I’m a slow learner, and often have to do it the hard way. In addition to throwing, I handbuild w/plaster hump molds to make non-round shapes – usually trays or platters – and add extruded feet and rims. It’s a different pace than throwing forms. Thanks for the blog Linda!